For a set of reasons that I will explain later, “the opposite of property” is a concept that is much more important when we come to the world of ideas, information, expression, and invention. We want a lot of material to be in the public domain, material that can be spread without property rights. “The general rule of law is, that the noblest of human productions—knowledge, truths ascertained, conceptions, and ideas—become, after voluntary communication to others, free as the air to common use.”12 Our art, our culture, our science depend on this public domain every bit as much as they depend on intellectual property. The third goal of this book is to explore property’s outside, property’s various antonyms, and to show how we are undervaluing the public domain and the information commons at the very moment in history when we need them most. Academic articles and clever legal briefs cannot solve this problem alone. Instead, I argue that precisely because we are in the information age, we need a movement—akin to the environmental movement—to preserve the public domain. The explosion of industrial technologies that threatened the environment also taught us to recognize its value. The explosion of information technologies has precipitated an intellectual land grab; it must also teach us about both the existence and the value of the public domain. This enlightenment does not happen by itself. The environmentalists helped us to see the world differently, to see that there was such a thing as “the environment” rather than just my pond, your forest, his canal. We need to do the same thing in the information environment. We have to “invent” the public domain before we can save it. . . .
La question du "domaine public" abordée par un des fondateurs de Creative Commons. Même si ici le sujet paraît abordé d'un point de vue plutôt juridique (les oeuvres "tombées" dans le domaine public, les oeuvres libres de droits, la propriété intellectuelle, le copyright, etc. ), c 'est une question qui nous intéresse depuis plusieurs années par rapport à l'espace public. L'extension de l'analyse du réel ("reality mining", tracking, monitoring, surveillance, etc.) mite et mine progressivement l'espace public. Celui-ci, analysé par des technologies souvent propriétaires produit des données dont on ne connait pas l'exploitation, par qui, pourquoi? Probablement que ce livre développe des thèmes intéressants par rapport à la question général du domaine public. A lire éventuellement dans le contexte de Globale Surveillance, projet en cours avec Eric Sadin. The transition team is testing Web tools that could power the next presidency. 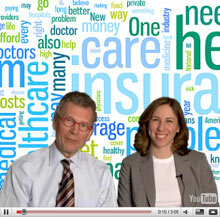 Feedback loop: Former Senator Tom Daschle and Lauren Aronson of President-Elect Obama’s health-policy team in front of a “word cloud” of the 100 words most commonly used in online comments about health policy on the transition team’s website, www.change.gov. Watch Daschle and Aronson respond to online comments. After President-elect Obama nominated Tom Daschle for health secretary, Obama's team--in a first for a presidential transition-- invited people to post comments regarding health policy on his Web site, change.gov, attracting more than 3,700 responses. Then they had Daschle and a policy aide to record a video earlier this week to directly answer those citizen comments online. It's a small taste of a Web-centric communications strategy to come. With about six weeks to go until Obama's inauguration, more Web feedback efforts are in the works, and the Obama team is planning to release a kind of digital campaign yearbook. They are also sketching out the administration's new-media strategy. While the details of that strategy are unknown, the president will have at his disposal databases of unprecedented size and sophistication on his supporters--and voters generally--including their views and their past efforts as pro-Obama volunteers. In the near term, the public can expect more features on change.gov, says Jascha Franklin-Hodge, cofounder of Blue State Digital, the company that built that site and the campaign's online social-networking tools. "One of the things the transition team was keen to do was open the site to the best ideas that were out there, in terms of technology," says Franklin-Hodge. IntenseDebate, for example, supplied the commenting tool used for feedback forums such as Daschle's. "There are a few other [third-party tools] coming that are likely to get integrated into the site." The administration is also planning to release a digital paean to supporters. Shortly after Obama won, change.gov invited people to share stories from the campaign's front lines. "They will be packaged and used as part of the inauguration--stories showing the value of the lone organizer," says Thomas Gensemer, managing partner of Blue State Digital. "You can imagine almost a yearbook. [Obama's people] are collecting a ton of really personal content, so it makes sense to have an archive of it online." This will be one of the ways the president-elect tries to maintain online ties to his supporters--reachable through an email list 13 million strong--the biggest in U.S political history. In the longer term, if Obama wants to turn these celebrated lone campaign organizers into a collective cudgel to influence policy, what's clear is that an arsenal of tools awaits. Lists of voters--once consisting of spreadsheets of spotty accuracy--are now updated and refined digital assets available through new online interfaces. Much of this overhaul was accomplished in the past couple of years by Voter Activation Network, in Somerville, MA. Already, the Obama camp has exploited VAN's front-end systems. Anyone who went through my.barackobama.com to call voters before election day was using VAN interfaces; the lists of voters came from the VAN servers. And when callers extracted information from voters--such as who they planned to vote for or what positions they held on various issues--this refined information fed back to the VAN database, where it lives on. "The big question is how to parlay this kind of organizational capability into other things, like governing, like getting legislation passed," says VAN founder Mark Sullivan. Although he doesn't know what the Obama administration is planning, Sullivan predicts that "going forward, people are going to govern through a very different level of communication with the people they are governing." For example, pity the member of Congress who might try to hold up Obama legislation on, say, health care. In theory, supporters of the Obama administration could use the VAN database to generate lists of registered voters who not only live in that member's congressional district, but who also expressed a strong interest in health-care reform or attended an Obama health-care event during the campaign. The database could also indicate who was likely to take up the fight, based on their prior history of donating or phone-bank volunteering, and provide clues about how these constituents could best be unleashed against the offending lawmaker. The Obama administration or its supporters could also tap into the collective intelligence stored in the databases of Catalist, a voter-database company founded by Harold Ickes, former deputy chief of staff in the Clinton White House. Catalist synthesizes databases of myriad progressive organizations to build ever-more-sophisticated understanding of voters' belief systems and how they translate into votes and support across causes. Ickes says, "Come January, as [Obama and his team] start to focus legislatively on what their program is going to be--big stimulus package, health care, employee free-choice act--they will have some big initiatives. Obama is thinking big, but when you think big, you have to mobilize people. You can go [to specific groups] with a very targeted message ... and have them, in turn, call and write and telephone and text-message. It is enormously powerful." The extensible Obama ou The ubiquitous Obama?